Extension cords help us power the increasing number of electronic devices we have in our homes, especially when outlets are limited. They're a convenience in one sense, but they also can be very dangerous. Overcrowding an extension cord or power strip is a no-no, of course, but according to the Electrical Safety Foundation International, continual use of an extension cord "can cause the insulation to rapidly deteriorate, creating a dangerous shock and fire hazard." Extension cords cause about 3,300 residential fires each year, injuring or killing more than 300 people. Be sure to put your extension cords away after every use as well; if left unattended around children, they can present a hanging or choking hazard. Mothballs in homes aren't as common as they used to be, but if you have these tiny orbs of pesticides, you should be aware of the dangers they present. The primary ingredient in mothballs is naphthalene, which "causes a breakdown of red blood cells in children with a genetic condition called G6PD deficiency," and pediatricians in Australian called for a ban on naphthalene after it was linked to one baby's death and brain damage in two others. Paradichlorobenzene is another common ingredient in mothballs, the exposure to which has been linked to nausea, vomiting, dizziness, fatigue, headaches, and eye and nasal irritation in humans, and kidney and liver damage in pets. As an alternative to mothballs — if moths are a problem for you — wash and dry your clothing, and shake them before putting them away. You also can store your clothing in airtight containers. In addition, you should vacuum out drawers and closets to rid the areas of potential larvae. The benefits of using a humidifier to suppress a cold are debatable, but one thing's for certain: If you don't clean the humidifier properly, it can cause more harm than good. Water left to sit in the humidifier for long periods of time can harbor mold spores, fungus and bacteria. Turn it on without cleaning it properly and you're sending all those germs directly into the air you breath. To prevent this, empty and clean the water container after every use, and only fill it with distilled water. You're probably asking yourself how pressed wood can harm you and your family? One word: formaldehyde. The chemical can cause watery eyes, burning sensations in the eyes and throat, and formaldehyde can trigger attacks in people with asthma, according to the United States Environmental Protection Agency. There also is evidence that it can cause cancer in animals and may cause cancer in humans after prolonged exposure. Potential pressed-wood products you may have in your home include hardwood plywood wall paneling, particleboard, fiberboard, and furniture made with these products. If you have pressed wood in your home — and you're experiencing the medical issues associated with exposure to pressed wood — consult your doctor. The best way to avoid these issues, however, is to avoid pressed-wood products, or to seek exterior grade pressed wood. Look into what you're buying, and decide whether or not this is the best purchase for you and your family — no matter how good of a deal it may seem. Your carpeting may seem innocuous enough, but it's emitting some potentially dangerous chemicals known as volatile organic compounds (VOCs), which come from the glues and dyes in the carpet. Not much is known about the specific chemicals that new carpets may release, and generally these emissions subside after the first few days, but it's an important fact to consider before adding carpet to your home. You also should consider that carpet can trap pollutants — dust mites, pet dander, mold, dirt, and more — that can adversely affect anyone with respiratory sensitivities. Consumer paint hasn't contained lead for over 30 years, but if your home was built before 1978 there's still a chance of lead-based paint exposure from old paint on your walls, doors, baseboards, and window sills. To check your home for lead paint that may still be lurking in the shadows, the EPA suggests scheduling a paint inspection and risk assessment to ensure your family's safety. Polycarbonate plastic is used to make many material goods possible — like eye-glass lenses, lightweight luggage, and computer cases — and in most of these instances, the danger is slim to none. When polycarbonate plastic is used to make food storage containers, however, that all changes. The controversy comes from the degradation of the chemical bisphenol A (BPA) when it comes into contact with water. When tested on animals, it may have been responsible for the enlargement of reproductive organs in female mice. Because of these potential dangers, many plastic food-storage containers now advertise that they're BPA-free. Flame retardants are chemicals found in many products to prevent them from burning easily when exposed to fire. These chemicals are commonly found in mattresses, upholstery, and kids' items like stuffed animals. Recently the Center for Environmental Health tested children's chairs, sofas, and other furniture from major retailers and found that all but four of them contained toxins that have been linked to cancer, birth defects, diminished I.Q. and other problems. It's a good idea to stay abreast of the still relatively new controversy over flame retardants to make the most informed decision on what products you're buying for your home and for your children. Space or electric heaters are often economical alternatives to your whole-house heating system, but they're also the cause of many home fires every year — more than 25,000, in fact. To reduce your risk of a home fire from a space heater, SafeElectricity.org recommends purchasing only space heaters that have been safety tested and UL approved and are equipped with an emergency tip-over shutoff feature and heating element guards. And, of course, never allow pets or children near a space heater. 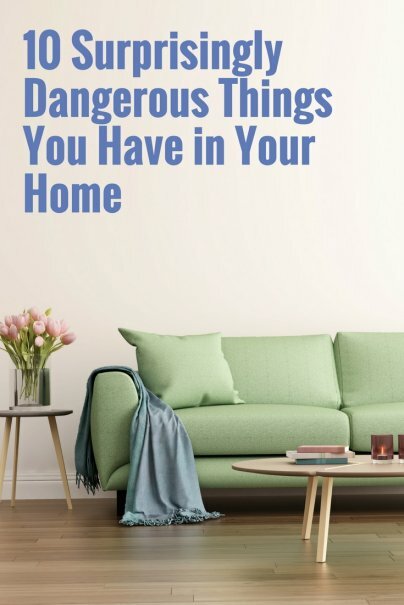 Do you have other suggestions for dangerous things in your home to add to the list? Let me know in the comments below. Good choice in photo! That is essentially the look that my toddler gives me when I tell her not to put the cat in the dryer.